Summary: Responsible owners allow their pit bulls to socialize at a young age to avoid destructive behavior. Pit bulls make amazing family pets and companions. They’re always playful and cuddly. Additionally, they’re intelligent and easy to train, but they can also be a bit on the stubborn side as well. However, the sooner you start training them, the better their behavior will be once they start to grow. 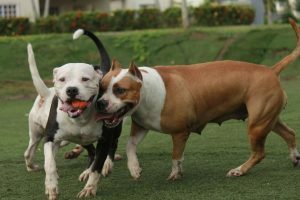 This article is designed to discuss the importance of early socialization when it comes to raising pit bull puppies. These tips can help you start the basics from training them to perform basic actions like going to the bathroom where you want them to go, to making sure they’re obedient. A responsible owner will start training them at a young age. This is where they can be taught right from wrong and start developing a sense of their surroundings. Remember, once they enter your home, everything’s foreign in their eyes. All they see are a bunch of play toys, objects to chew on, and a wide space to run around. Always be sure to set boundaries and limitations so he knows what to do and what not to do. When it comes to socializing your pup, it’s important to get him accustomed to other animals and people from day one. This way, he has no chance of developing tendencies towards aggression as an adult. One of the best ways you can go about doing is to take him out on daily walks and have him interact with the environment around him. Developing good habits from the start is what it’s all about. Once he starts getting used to people and animals, he’ll tend to see them less as a threat and more of a harmless guest. Blog submitted by Iron King Kennels: Iron King Kennels has the finest red nose pitbull breeders in the country. With decades of expertise on their side, you’re always in good hands.